Combine 1 teaspoon salt, five-spice powder, and pepper in a small bowl. Scrape pork belly rind with knife to remove impurities. Rinse and drain. Bring a pot of water to boil. Blanch pork belly in boiling water for 10 minutes. Remove and pat dry with paper towels. Place pork belly on a tray with meat side up. 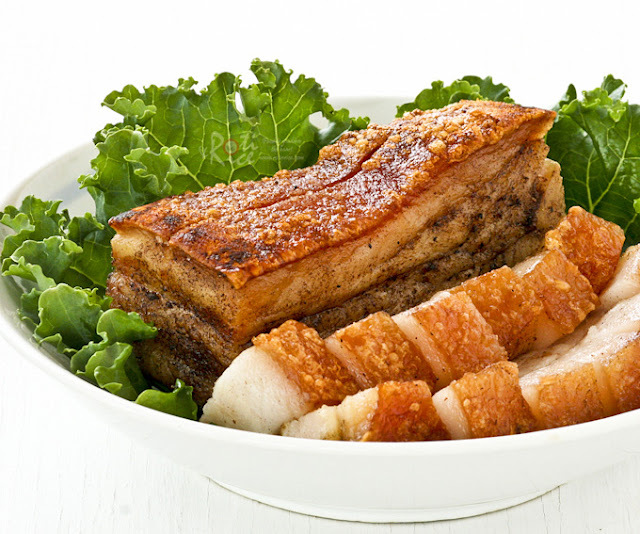 Use a knife cut several lines about ¼ inch and 1 inch apart deep along the length of the pork belly. Rub salt mixture evenly onto the meat. Flip the pork belly over. Again cut several lines about ¼ inch deep and 1 inch apart along the length of the pork belly. Pierce rind all over with a fork. Pat dry with paper towels. Rub remaining 1 to 2 teaspoons of salt evenly onto the rind. Place pork belly on a rack over the tray and allow it to dry uncovered overnight in the refrigerator. When ready to roast, pour just enough water to cover the base of the tray without wetting the pork belly. Roast in a 375°F (190°C) oven for 50 to 60 minutes. Remove from oven. Move oven rack with mittens to the top most level close to the broiler. Return meat to the rack. With the oven door slightly ajar, turn oven to broiler setting. Rind will start to blister and crack. Allow it to continue to grill for approximately 10 minutes or when rind is evenly blistered. Remove when done. Allow it to rest for 10 minutes. Remove charred bits by scrapping with a knife. Cut into desired serving sizes. Serve immediately with mustard and sweet chili sauce.